Ben Crenshaw - best putter in golf? Golf's Best Putter: ... Ben Crenshaw? If elegance and effectiveness were the only two criteria for judging a great putter, Ben Crenshaw would in our minds be the greatest. There were two elements that contributed to Crenshaw's impeccable touch and feel on the greens. Firstly his Wilson 8802 putter, or "Little Ben" as he named it. The club that stayed in his bag throughout his career, was bought for $20 by his father out of Harvey Penick's shop. Penick himself was the second element - a great friend and mentor who was Crenshaw's coach throughout his playing career. Penick told Ben "never try and look like anyone else when you're putting." Crenshaw himself has also commented on the importance of individuality when putting: "I don't think there's any right or wrong way to putt". For Crenshaw, the art of putting is the perfect blend of pace, feel, and green reading. 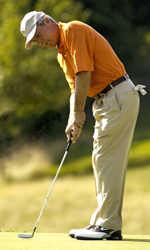 Anyone who knows putting would recognise Ben Crenshaw's famous silhouette over the ball: the tall posture with a slight bend in the knees, the ball forward in his stance. He used what is often called a "barn door" stroke - inside and open to the target line on the way back, returning to square at impact and inside and closed on the way through. He also kept his right shoulder lower than his left to help promote this movement consistently. One of the ways that Crenshaw enhances feel when putting is by gripping the putter as sensitively as he can to make the putter appear heavy, thus the putter will swing freely and you consequently have a better idea of where the clubhead is through your hands. Ben Crenshaw believes that most people grab the club too tightly, and that it should be held more as a "delicate instrument." Other than that his grip is relatively similar to that of the full swing. Both thumbs are placed down the flat part of the grip with equal pressure in both hands - that way he feels the palms are going more towards where he strokes it. In terms of set-up, Crenshaw distributes his weight 60/40 on left, much like the method of the late Seve Ballesteros. This feeling is a good way of keeping the hands in front of the putter blade at all times. With the exception of perhaps Bobby Locke, the best putters are usually square or open at address. Crenshaw is no different. He always sets up slightly open with his arms hanging down for a more comfortable address position with less tension. 1) Pace is always more important than line. 2) Maintain an even tempo back and through. 3) Stay down through the putt - don't be anxious to see the result. 4) Choose your putter length based on your arm length (Crenshaw used a 34" putter because of his long arms).